UCD Marian coach Ioannis Liapakis believes handling an "aggressive" Kieran Donaghy will be key as his side face Tralee Warriors twice within 24 hours to help decide Super League glory. The Greek coach has highlighted the former Kerry footballer's style of play and called on referees to be vigilant in both games, with three sides bidding for the title this final league weekend. "I think the most important thing is if the referees allow Donaghy to play so aggressive," Liapakis says. "If the referees (are) on the spot (and) call every single foul in every single situation, then I think Donaghy is going to have a problem. We have to see. "Donaghy, he's a huge part of the Tralee game. He's doing many things; he's playing defence, he's taking rebounds, he's scoring. He's a weapon. He's a tool that can do many, many things." Warriors, who are the only club that have their fate in their own hands, can win the title if they beat the Dubliners twice this weekend - today in the UCD Sport Centre (5.0) and tomorrow at Tralee's Sports Complex (5.0). If Warriors win just one game, they will face Templeogue, provided they beat Moycullen this weekend in NUIG (7.30pm), in a play-off for the spoils. Marian must win both games to secure either a play-off with Templeogue to retain the title, or outright victory if their city rivals lose today. UCD and their opponents had been due to play one of this weekend's games in December before Tralee, whose coach Pat Price is also the Irish U-16 boss, requested a change which now sees both sides playing twice in one weekend. 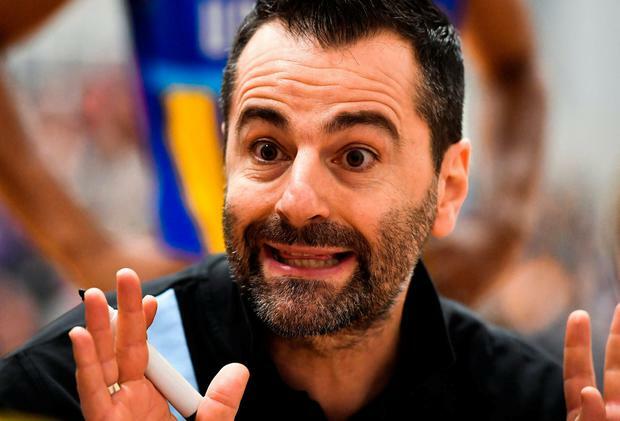 Liapakis calls this unusual scenario "totally wrong", with the season coming down to the wire. "It never should have happened, something like that. It was not our fault," he said. "It does not make any sense. Not just for me, for everybody. It never happened before, something like that. So I don't understand why Basketball Ireland agreed to something like that." Following tonight's game, the reigning league champions will drive the 300km to Tralee, arriving at around midnight, where they will spend the night before tomorrow's clash in the Kingdom. Liapakis doubts, however, that many UCD supporters will be able to follow them to Kerry for tomorrow's crunch game. "The tickets, they are going to be sold out in a few hours so I don't think we're going to be able to bring in supporters down there. It's going to be us against the whole of Tralee," he laughs. Liapakis believes, however, that Tralee are under greater pressure to produce this weekend, which could play into his side's hands. "First of all our annual budget is like the monthly budget for Tralee and Templeogue. So, definitely, they have a lot more pressure to deliver than us," he claims. "And the second thing, when we lost to Neptunes at the end of November - and that was the fourth loss we had in the league - nobody expected that we would be able to win the league. "We are just happy to be labelled to be one of the three contenders."